Jeanine T. Patrick, of Patrick & Patrick CPA’s reveals that twenty years after Sir Elton John sold his record collection at a Sotheby’s auction to raise funds for his Aids Charity, a thorough inventory has uncovered that not only is the Collection much larger than originally expected but a wealth of surprising treasures have been unearthed. The Elton John Collection, sold by the artist to fund his Aids Charity, was originally believed to consist of 50,000 items. In actuality, the personal collection, which the artist enhanced with the purchase of legendary BBC Producer, Bernie Andrews personal collection; contains more than 70,000 items consisting of singles, albums, 8 track cassettes, compact discs and unique studio tapes. The Collection was created from the artist’s prolific personal record purchasing, personal gifts and material from his record company Rocket Records. Especially notable are singles from his youth, signed as Reg Dwight and in sleeves he customized with newspaper and magazine clippings from artists of the time. “The richness of the collection clearly reflects a passion and curiosity for all genres of music. It is not only comprehensive, but arguably a definitive portrait of the 50’s through the 80’s and possesses an enduring value and importance. With the Collection’s rarities, unique editions and historical releases, I can’t imagine there is another collection quite like it in the world,” said Stephen M. H. Braitman of musicappraisals.com, the Collection’s appraiser. Unlocking a Historical Collection’s Secrets Jeanine Patrick, of Patrick and Patrick CPA’s, was tasked with valuing the Collection, which arrived with minimal accompanying data, making a full inventory essential. So why did that take 20 years? That all changed when a discussion with a business associate resulted in an ingenious solution. Creativity, teamwork and completely throwing away all conventions of how to inventory a collection saw them develop a system that began a modern day treasure hunt. Their solution, I-Stream, has created a complete visual ‘virtual collection’ that is accessible on the client’s desktop. The I-Stream process integrates asset protection, security protocols, layered processing and allows for remote live monitoring of the inventorying process in a fast, affordable, reliable and accurate way. From a business feasibility perspective, I-Stream allowed Patrick to provide an inventory and valuation in record time. And the process laid bare unexpected and previously undocumented rarities, such as 30 year old studio reel to reel tapes of rough mixes and copies of Elton John’s studio sessions. Leveraging the archival expertise of Abbey Road Studios, the team at I-Stream,transferred the reel to reel content into studio quality digital files to be stored with the Collection, and created MP3 copies, which can be played on the virtual collection software. additional funding totaling $1.6 million over two years to support over 50 community organizations providing needle exchange and harm reduction services for injection drug users. The Elton John AIDS Foundation (EJAF) is very pleased to announce that Steven Tyler, a generous Foundation supporter and an Event Chair for EJAF’s 20th annual Academy Awards Viewing Party, is working with EJAF to help make its 20th Oscar-night event especially successful. Through an auction on Charitybuzz Steven is inviting the highest bidder to be a guest at his table for the Party. The winner of the auction will be a guest of Steven Tyler and Erin Brady, dining at their table for the February 26, 2012 event, which will be held at the newly redesigned West Hollywood Park inWest Hollywood, CA. The Foundation’s 20th annual event will feature a cocktail reception, an incredible dinner prepared by celebrity chef Cat Cora and served during the Oscar telecast, an exciting live auction, and an after-show performance by Foster the People. Chopard, Neuro, andWells Fargo are the Presenting Sponsors for the event, and American Airlines is the official airline partner for the Foundation. Visit Charitybuzz at http://www.charitybuzz.com/catalog_items/292796?preview=1 to bid on this incredible opportunity to enjoy the Oscar telecast with Steven Tyler, Erin Brady, and their guests and to support the urgent work of the Elton John AIDS Foundation. The Elton John AIDS Foundation (EJAF) will celebrate its 20th Annual Academy Awards Viewing Party on February 26, 2012 at the newly re-designed West Hollywood Park in Los Angeles. 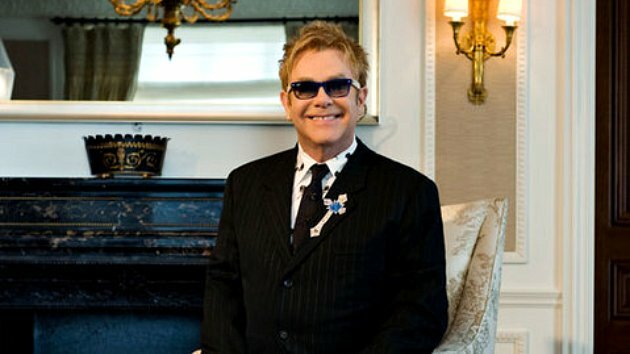 Sir Elton John and David Furnish will host the gala event sponsored by Chopard, Neuro and Wells Fargo. This year celebrity chef Cat Cora will prepare a special menu to be served to guests seated to watch a live telecast of the 84th Academy Awards. Following dinner, Grammy nominated Foster the People will take the stage to perform. The Elton John AIDS Foundation Academy Awards Viewing Party is the most highly visible and successful fund-raising event in Hollywood on Oscar night. Over the past 20 years, this annual event has raised millions of dollars thanks to the generosity of the Foundation’s supporters. The money raised is used to increase EJAF’s investments in its grant-making initiatives, which support HIV prevention and treatment programs, stigma reduction efforts, and direct services to persons living with HIV/AIDS, especially marginalized populations with special needs. This annual event has historically attracted the biggest names from the culinary community to prepare dinner for guests and this year is no exception. Celebrity chef Cat Cora, supported by Los Angeles Crumble Catering, will prepare an exquisite 5-course meal for guests that will include sesame encrusted lamb meatballs with harissa yogurt, sauteed sea bass with lemon couscous and piquillo pepper saffron sauce, and chocolate budino with whipped cream and fresh berries. Cat Cora made television history when she became the first and only female Iron Chef on The Food Network’s “Iron Chef America,” has authored three top-selling cookbooks, and opened three restaurants including Cat Cora’s Kitchen, which opened in April 2012. Following dinner Grammy nominated Foster the People will perform for guests. Best known for their hit single “Pumped Up Kicks” off their debut album Torches, this trio will have guests moving to their towering choruses, gut-leveling lyrics and rhythmic beats. This year’s event co-chairs are Bill & Tani Austin, Johnny & Edwina Barbis, Ted Danson & Mary Steenburgen, Ellen DeGeneres & Portia De Rossi, John Demsey, Drs. Jeffrey & Nancy Gallups, Tim Hanlon & Anthony Klatt, David Geffen, Neil Patrick Harris & David Burtka, Hugh Jackman & Deborah-Lee Furness, Diana Jenkins, Quincy Jones, Ryan Kwanten, Fred Latsko, Sandra Lee, Baz Luhrmann & Catherine Martin, Eric & Janet McCormack, Sharon & Ozzy Osbourne, Tyler Perry,Caroline Scheufele, Sharon Stone, Steve Tisch, Steven Tyler, Edward Walson and John Waters. Elton John has reportedly signed on to pen a new book about the fight against AIDS. The volume, titled Love Is the Cure will be published by Stodder and Houghton and proceeds from its sales will fund the Elton John AIDS Foundation. According to RollingStone.com, the book will be released in July to coincide with the international AIDS conference in Washington, D.C.
An audio version of the book, read by the “Rocket Man,” will also be released.